Welcome to the Eddy's Bread Sign Restoration Project. This project is a tribute to one of Helena's great entrepreneurs and community leaders: J.E. "Eddy" O'Connell. On September 14, 2012 work began to restore the Eddy's Bread sign on the north face of the Iron Front Hotel. See the photos in the Project Photo Album. The restoration is being performed by the "Wall Dogs" a dedicated group of artists working throughout the country to restore and preserve historically significant "ghost signs". Please sign the Guest Book and share your memories of J.E. O'Connell, Eddy's Bread or any other Helena memories you wish to share. 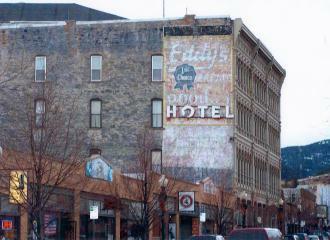 Eddy's Bread ghost signs exist throughout the northwest - help identify the location of the signs and post to Eddys Ghost Sign of Facebook or e-mail photos to EddyGhostSign@Hotmail.com.